Or, gain additional, weatherproof storage space. Marquees may be synonymous with weddings and televised baking competitions these days, but these semi-permanent structures have a huge range of uses. Much more affordable and subject to fewer planning regulations than permanent buildings, they are great way of expanding commercial space for storage, retail or more. If you’re looking to grow the physical footprint of your company but don’t want to move or go through the lengthy and disruptive construction process, then commercial marquee hire from Weatherill Brothers is a very good option. We’ve been designing and building all types of marquees for over five decades, so we know what materials and designs work best for different use options. If you’re looking for storage space, you need a tough, hard-wearing exterior with good lighting. If it’s a retail space then you might want heating or window options incorporated. 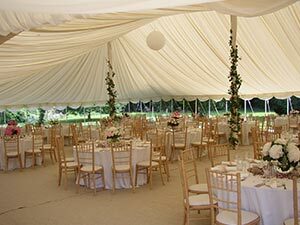 Whatever you need in your marquee, we can create a solution to suit your needs. Choose the size, style and shape, and our team of experts will design and build your marquee to the highest possible standards. Just get in touch on 01953 882 394 and tell us what you’re looking for. We’re always happy to help.